"The hallmark of Royalton Luxury Resorts has always been to bring award winning first-class resorts to the world's most breathtaking vacation settings," said Jordi Pelfort, Managing Director of Blue Diamond Resorts. "We are very pleased to announce that we have accomplished that with these brand new modern luxury resorts on the breathtaking white sand shores of Negril, Jamaica." 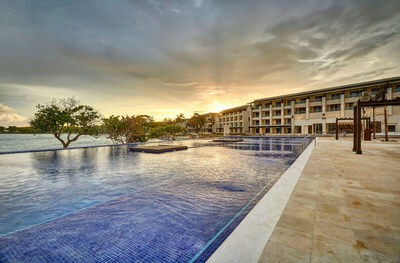 "Jamaica has been very welcoming to Royalton and we've enjoyed tremendous success with the Royalton White Sands and the newly opened Royalton Blue Waters," said Courtney Miller, General Manager, Royalton Negril and Hideaway at Royalton Negril. "We are confident that our highly anticipated Negril resorts will set a new standard of luxury for both international travelers and Jamaican visitors to the area." The resort's footprint sprawls along the water offering guests three distinct vacation experiences: the family-friendly resort, a Diamond Club™ area for superior service and Hideaway at Royalton Negril for adult guests only. For groups, families or those who seek a more elite vacation experience, the Diamond Club™ Chairman's Building offers unparalleled waterfront views. Ideal for larger groups or extended family, the industry-leading four bedroom ocean front suite offers a separate butler entrance, ocean view bedrooms and a large terrace for delicious meals al fresco. Hideaway at Royalton Negril offers a unique ocean front lobby for Diamond Club™ guests, who can enjoy a cocktail in the sunshine and check-in to the soothing sounds of gentle ocean waves.